Give fish a smart, Italian kick with zesty dressing, baked tomatoes and melty mozzarella. Mangia! Mangia! 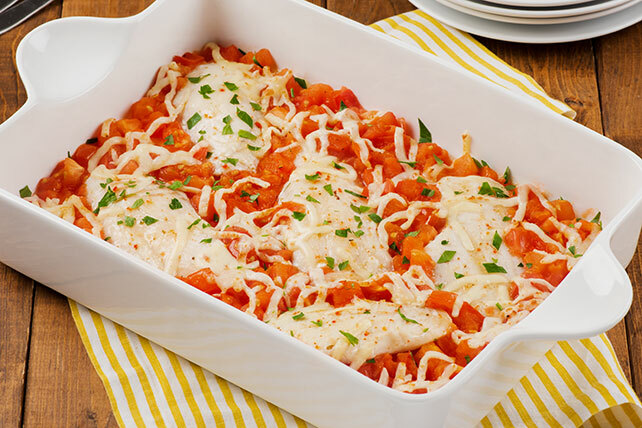 Place fish in 13x9-inch baking dish; drizzle with dressing. Bake 25 min. ; top with tomatoes and cheese. Bake 5 min. or until cheese is melted and fish flakes easily with fork. Serve with hot cooked rice and steamed vegetables. No need to thaw the fish before using as directed. Prepare as directed, using frozen halibut or cod fillets.